Not to be confused with Bläckout from St. Wendel, Saarland. 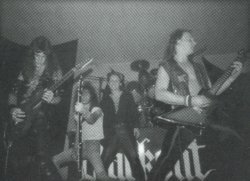 Like many other metal bands Blackout were not allowed to perform in East Germany. Jan Lubitzki was imprisoned in 1986 because he tried to flee into the West. The band was finally forced to split-up in 1988. After the German reunification they reformed as Depressive Age.